Whether you’re seeking to fill an internship, part-time or full-time position, the job bank is provided to you as a resource to combat your hiring obstacles and grow your business. At no additional charge to your membership, you can post your open job positions or search the resumes posted by job seekers. Simply visit the job bank and log in using your company username and password to complete the online form. The form fields include the position type, job start date, description of duties and more. Once your job is approved, it will be displayed on the page source and categorized by industry. For assistance in posting your job, contact blamont@sarasotachamber.com. Job searching is a daunting task. 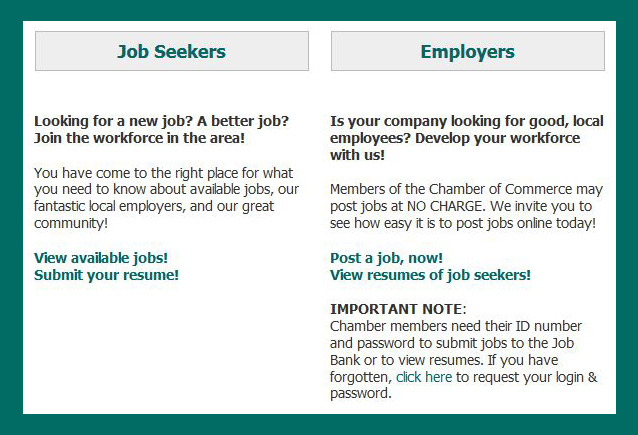 Search for local jobs with the assurance of credibility from Chamber members using our online job bank. You can search all posted jobs in the bank or submit your resume. Search job listings by industry, company name, job title or position type. Anyone can visit the site to search available positions. With continued use, the job bank will grow into a database that site visitors and job seekers will use for years to come. Striving to promote jobs directly in the Greater Sarasota area, we hope that the job bank will bring great benefit to not only our members but our community. For more information about the job bank, contact blamont@sarasotachamber.com. Visit our job bank at http://www.sarasotachamber.com/jobbank. Interested in Greater Sarasota Chamber membership? Visit our website for more information or call (941) 955-8187. This is FABULOUS. I am resending this to two fellow Chamber Members just to make sure they too see this. We were just conversing about this very same employment issue.